The Brittany is an agile, energetic gun dog that was originally bred as a stylish bird-hunting dog on both sides of the Atlantic. A versatile sporting dog, Brittanys make an intelligent, affectionate, and playful pet for families, while also eager and tireless out in the field. As such, it’s a breed that requires a great deal of exercise, but one that will enjoy every active moment with its family. 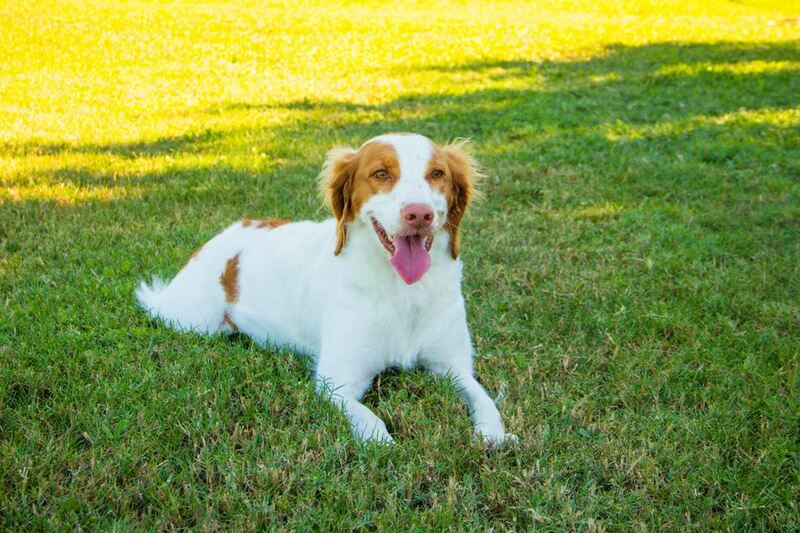 Bird dog lovers and families alike appreciate the “softness” of the Brittany’s face and its high-set ears, as well as its high energy level and eagerness to please. Although Brittanys resemble spaniels, the dog actually has more of the working characteristics of a pointer or setter. Therefore, the American Kennel Club dropped the word “spaniel” from this pointing breed’s name in 1982. Brittany dogs earned their name because they were developed in the Brittany province of France between the 17th and 19th centuries. They were officially recognized as a breed in 1907. A pointing breed that was designed to become a versatile gundog, the Brittany was adept at both pointing and retrieving, which made these dogs well-suited to working in an array of country environments. Though few records were kept on this breed, it’s believed that the dogs that contributed to the Brittany’s development were the English Setter, Welsh Springer Spaniel, and possibly some other French spaniel breeds. The Brittany’s skills as a bird dog soon made the breed in-demand with hunters in other countries. The Brittany dog came to the United States in 1931 and, since then, they have also become popular family dogs because of their medium size and affectionate, friendly personality. A happy and alert dog, the Brittany is a rugged, high-energy breed that will require daily exercise, including frequent outdoor adventures or being taken for extra long walks every day. The dogs' convenient size and athletic build help them thrive in homes of people with active lifestyles, whether it's going for hikes or playing rigorous games of fetch. If the Brittany dog does not receive ample exercise, they are likely to develop behavioral issues, such as barking and hyperactivity to destructive chewing. The Brittany dog’s wash-and-wear coat will need just a weekly brushing to control shedding. A sensitive dog with a softer temperament, the Brittany responds best to gentle, calm training They are not likely to do well in tense, stressful home environments or situations. Fortunately, the breed is smart and eager to please, so they aren’t particularly difficult to train. Brittany dogs crave companionship, so they are susceptible to separation anxiety when left alone for more than a few hours. Some Brittany dogs become anxious, which they will express by chewing and barking. Like most breeds, the Brittany also needs proper training and socialization; when well-socialized, most of these dogs will become gentle and peaceful with both people and other animals. Some Brittany Dogs may be timid, submissive, and have a tendency to whine, so early socialization will help them develop a confident, easygoing temperament. Adolescents can be particularly submissive, so they may urinate when becoming over-excited or intimidated, such as when an adult is standing over them or reaching over to pet them. This issue can also be corrected with time and training. The Brittany is generally a healthy breed but prone to some genetic health issues, such as hip dysplasia, a malformation of the hip joint. The breed can also be impacted by the seizure disorder epilepsy, hypothyroidism, and adult cataracts. Some Brittany dogs are born with a cleft palate. Due to their high levels of activity, Brittany owners may also have to have their dogs treated for physical injuries that can happen while playing or working outdoors, such as lacerations, broken bones, or ligament tears. The Brittany Dog will perform well with any high-quality dog food but will thrive on a higher-protein diet. As an especially active breed, they may require more water than the average dog. Brittany dogs are high-energy pals for active people. Brittanys don't need a lot of grooming, making them low-maintenance when it comes to hair care. Brittany dogs aim to please their humans. Brittanys are prone to genetic health issues, particularly hip dysplasia. Brittany dogs need a lot of attention, which isn't ideal for people who are out of the home most of the day. Brittanys often demonstrate separation anxiety.